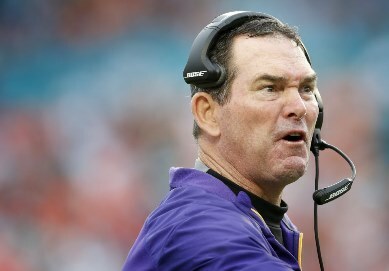 Vikings head coach Mike Zimmer is a no-nonsense guy who doesn’t look for a lot of excuses when it comes to winning and losing. It shouldn’t be surprising, then, that Zimmer — when asked Wednesday at the Senior Bowl about the ball deflation controversy that has emerged in the wake of the Patriots’ AFC title game thrashing of the Colts — wasn’t buying it. Well, 45-7, but point taken. That said, the Vikings were EMBROILED IN CONTROVERSY over a somewhat similar ball situation earlier this season (and by that we mean it passed with barely a whimper aside from a warning and reminder from the league), when sideline attendants were shown heating footballs against league rules during Minnesota’s freezing 31-13 win over the Panthers.